News - Rugby League Spreads it wings to Ancient Africa! 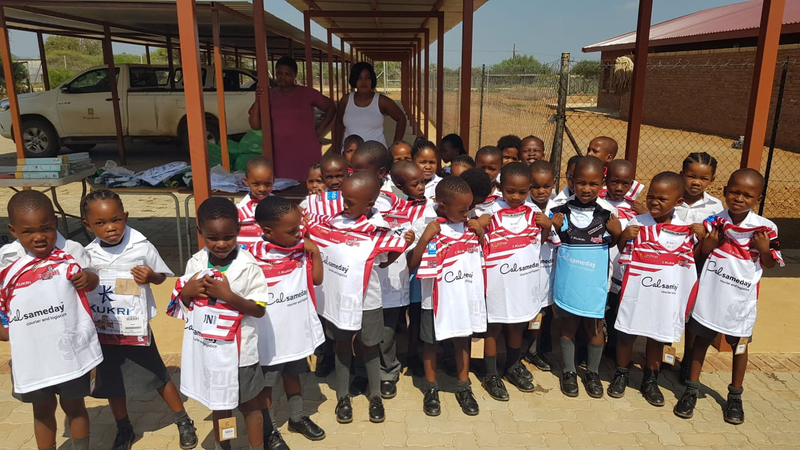 Christmas 2018 saw Leigh Centurions, in tandem with Golborne Parkside Pirates, spreading some cheer in South Africa in support of the Morukuru Family Goodwill Foundation. The Morukuru Family Foundation partner with local communities and through a number of initiatives help to improve the lives of the residents within the communities. Earlier in 2018, a young member of Golborne Pirates was fortunate enough to be able to visit South Africa. Inspired by the Morukuru foundation and with community spirit in mind, the Golborne Pirate had the idea to donate some rugby equipment to those less fortunate. With this in mind, The Young Pirate approached his pals and fellow teammates for assistance. Quickly, they had gathered enough unused equipment from the previous rugby league seasons to really make an impact. This escalated further when coach Tom Simms provided more kit from his fellow coaches and subsequent age groups. On hearing of this initiative, Leigh Centurions soon after jumped in to help and get involved with likewise offering all the unsold junior kits from the 2018 season. A prominent local business whom wish to remain anonymous also chipped in supplying boots, shin guards, balls & gloves. In true community spirit, everyone had come together to help with this great cause, quickly generating more gear than could easily be carried! With our factory and head office based in Golborne as per the Pirates rugby team, likewise as a Leigh Centurions Shirt sponsor; we were of course delighted to see the fantastic initiative shown here and very proud and pleased for our brand to be associated with the same. Hilltop have also sponsored Leigh Miners Juniors RLFC who in similar spirit have also sent some of their playing kit to assist kids in Kenya. Hilltop Products & Leigh Centurions Director Steve Hill said – “It’s great to see hey! I'm absolutely delighted that the game we love is continually giving something back not only to its own local community but much further afield. Good quality New & used much-needed kit travelling halfway around the world to benefit these kids in South Africa, Kenya likewise with a similar scheme. I think it’s fair to say that Rugby League can now drop that old outdated paraphrase of “only being concerned with the M62 corridor” long may that continue to be the case. "